The 8-month-old child remains hospitalized after the Jan. 2 incident, police said. 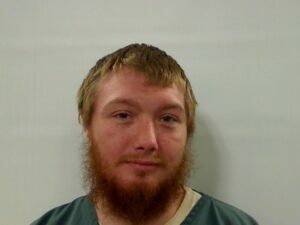 Maine State Police have charged a Vassalboro man with assaulting his infant son. Dylan J. Wood, 23, was arrested March 16 on two felony charges of aggravated assault. His son — 8-month-old Blaze Wood — was injured seriously Jan. 2 and taken to MaineGeneral Medical Center in Augusta before being taken by LifeFlight of Maine helicopter to Maine Medical Center in Portland. On March 14, he was in the hospital’s neonatal intensive care unit. According to the arrest affidavit, Blaze Wood was living with his father on Pooler Drive when the injury occurred. He also lived with his grandparents and his uncle, who were working and at school, respectively, during the time of the incident. Blaze Wood woke up lethargic around 7:30 a.m. and was not acting like himself. Dylan Wood gave the baby a bottle of formula, and he drank it all. Dylan Wood said Blaze stayed in his sight, and that the two played together. Later in the morning, the affidavit said, Blaze refused food and started getting pale. Dylan Wood and his mother, Helen Wood, took the baby to MaineGeneral after she returned from work later that day. Porter did not respond to requests for comment on Blaze Wood’s condition. The affidavit said that Wood learned from MaineGeneral that his son had a fractured skull and a brain bleed. “… (P)art of his brain is described as being ‘dead’ and unable to recover from his most recent trauma,” the affidavit said. Blaze had a six-month checkup Dec. 31 with Kennebec Pediatrics, Dylan Wood told police, according to the affidavit, and had several shots, but displayed no signs of illness. McCausland said the decision to charge Dylan Wood was made by the Kennebec County District Attorney’s Office. State police Detective Mark Ferreira, a member of the Major Crimes Unit Central Division, headed the investigation. Deputy District Attorney Frayla Tarpinian said a dispositional conference is scheduled for May with Dylan Wood’s defense attorney. Of the two aggravated assault counts, one is a class A felony and one is a class B felony. The class A felony is punishable by up to 25 years in prison, while the class B felony could mean up to 10 years in prison. Dylan Wood was taken to the Kennebec County jail, and he has been released on bail.